I'll post the rest when they are done. Owner & designer at VFE Pedals. Please email me directly at peter@vfecustom.com if you need a quick response. I like your style Peter V...! Perhaps this isn't the proper place to ask you a question, but it seems like an opportunity for dialogue if you are game. No expectations, sharing your designs and exemplary spirit is already more than enough. Recently, I have been comparing a few different business models of pedal builders. High end, low end, boutique etc. When I look at the VFE model and product, I see well thought out and executed pedals at reasonable prices. The workmanship in my Triplet is impressive. I was wondering if you would care to offer any insights about your experince in the 'pedal business '. The ups, the downs, philosophy, building, suppliers, marketing,.. I saw these a while back.. They are full of great ideas and I find myself referring to them very often! Very cool that you are putting them out there for the DIY community! It shows that you not only have great designs but also demonstrates integrity and character which is "The Real MoJo" in my opinion! Now let's have those schematics for the Focus and Rocket EQ..
fuzzbunny wrote: I was wondering if you would care to offer any insights about your experience in the 'pedal business '. The ups, the downs, philosophy, building, suppliers, marketing,..
As you can probably tell, I don't check in here too often. The question is definitely not out of bounds. I'll do my best to answer candidly & succinctly. First of all, a very small percentage of pedal builders actually make a living off their pedal business. Most have another full time job or some other supplemental income. Many builders are making around minimum wage once you calculate all the time that goes into it (designing, building, order fulfillment, customer service, accounting, etc.). I dedicated myself to VFE full time for 6 years, and my profits vs. time calculated to less than an $8/hour, and that's BEFORE you take away the extra taxes that come with being self-employed. So when someone charges $200 for a pedal that cost them $30-$40 to build, I totally get it. This industry is too crowded and too small to turn a decent profit any other way. VFE's profit margins always ran on the low end of the industry, as I was sacrificing margin to gain more gross sales (since I was doing it full time). Now that I have gone back to teaching full time, I re-designed a much smaller lineup and lowered the price point to reduce my need to spend as much time/money marketing the pedals. In many ways the quality of the new line is better, but the price point is 25-40% less because I'm not in the same position I was when I relied on VFE as my sole source of income. As far as the controversy concerning clones or modded clones, I understand the feelings of both sides. Whatever your personal moral feelings are, it is not illegal to copy another circuit if it hasn't been patented - and most analog effect circuits can't be patented because they don't really do anything original at a circuit level. If you spend a ton of time creating a pedal, it will naturally feel like you are getting ripped off if someone else uses your idea. At the same time, no one starts completely from scratch - you didn't discover the laws of physics, develop technologies to build the various components, research and write equations that govern the basic structures of transistors, resistors, capacitors, op amps, etc. You also don't pay the people who did these things a royalty for their work, and you shouldn't have to. If you want people to buy your product for a long time, you can't rely on being the "original designer" as the sole justification for someone to buy your product over a clone or modded clone. It must be better in some way - better quality, better value, better customer service, better something. If it's worse than the competing product in every way, you can't complain about losing sales over it - that's your fault. I could keep writing for a long time on this, but the bottom line for me is transparency. Please don't lie to people and try to market your pedal as something it isn't. If you found a way to take a vintage or modern pedal and make it "better" in some way, then tell people what you did & why you did it. I don't care if you use slick ad copy if you don't lie or mislead people. I don't care if you goop or clone if you don't lie or mislead your customers. Add something new to the kaleidoscope that is the pedal industry, and then be transparent about what you have created. The best part of the pedal industry is that a large percentage of the builders are friends. I've had lots of great conversations with many of them, and there is general sense of goodwill towards the community as a whole. We are all pedal geeks, too, and we love seeing cool new pedals coming out from other companies - no matter how small or big of a company it comes from. The hardest part about the pedal industry is that it is very, very crowded. There were a good number of builders when I officially launched VFE in 2010, but now it is just ridiculous. It costs very little to start a pedal company, and the internet makes it really easy to learn to build your own pedals. This has made the visual component of the pedal more important, which is both really cool and unfortunate. It's cool because it forces us all to up our game in delivering a beautiful product. It's unfortunate because many companies spend significantly more $$$ on aesthetics than the quality of the internal components. This increases the cost significantly - not because the tone is "better", but because it looks cooler. As far as suppliers go, I've used Pedal Parts Plus, Small Bear Electronics, Mammoth Electronics, Mouser, Digikey, Arrow, Verical, Allied, Tayda, many eBay sellers, and more. You learn as you go which ones are good for which parts. For example, buying op amps from even the most reputable eBay sellers in China is still a risky proposition. I've also sourced parts directly from Alpha Products in California, Precision Resistive Products in Iowa, and Vimex in China. Sourcing direct allows for customization, and the quality of all 3 companies was great, but they often missed quoted lead times (PRP missed a quoted lead time by over 2 months). - Don't start a company selling products you can't repair. At least one of your pedals will break, and you should be able to fix it. - You're starting a pedal company, not a graphic design company. Don't get into this industry with a lineup full of clones or barely modded clones. We have enough of those already. - That said, ugly pedals don't sell very well, even if the tone is great. - Do your research, and evaluate your personal risk vs. reward (FYI, the reward isn't lots of money). - Be ready to spend 25% of your time answering emails (and probably more), and calculate that into your costs. - It's better to make $100 of gross margin for 2 hours of work than to make $200 of gross margin for 8 hours of work, so consider staying small and selling direct only. I peaked at $192K in gross sales when I had a strong dealer network, but my gross margins where no where near what they were last year on $130K in gross sales (over $120K of which were direct). In other words, I worked a ton of hours in 2012 and paid a lot of $$$ to employees, but made less money than I did in 2016 simply by going direct and lowering the number of pedals I had to build. Many thanks for your thoughtful insights Peter. I for one appreciate your candor and 'open source' approach. I find the pedal 'business' quite fascinating. So many sellers competing with each other, mostly selling small variations on similar circuits. Sadly, success is more often due to clever marketing rather than outstanding product or innovation but that's nothing new. The builders that are able to attract a following and deliver an interesting or better product catch my interest. I remember looking inside the VFE 'The Triplet' and appreciating the designing and skill it required to pack everything in so nicely. I also remember wondering, how the hell can the VonRutter family make any money building these? There is some really interesting ideas here. I recently heard the Standout/Focus pedal and really liked it, do you have information on that one? Thank you very much for your open and frank words, a very interesting and helpful contribution. I appreciate your circuit design very much because it is far away from the mainstream. You are an great expert with broad and deep knowledge. Thanks for sharing your designs and thoughts and insights on the FX pedal business. Would you be so kind to post the other version, or versions, of the Pale Horse? You can buy a zip file with all schematics and layouts for a tenner. Cub wrote: You can buy a zip file with all schematics and layouts for a tenner. I have a question though: The LPF/HPF denote C10K/C100K for the dual gang. Does anyone know if this is an option of one or the other or is there something here I am not aware of? I have done this, works fine.. I think the wafer swap is the easiest to attempt. Without actually attempting this (yet), methinks the swap leaves one in the correct order - i.e. : C10K/C100K - but the second pot is now C100K/C10K. For these circuits, I would have to delve deeper to see which side of the dual gang requires which values. One more thing... I looked at the schematics for these pedals with the C10K/C100K and they do not show which pot is which... the pot value fields are empty... anyone have ideas on this? I specifically was looking at the pinball and standout pedals in the collection. FeVeR2112 wrote: One more thing... 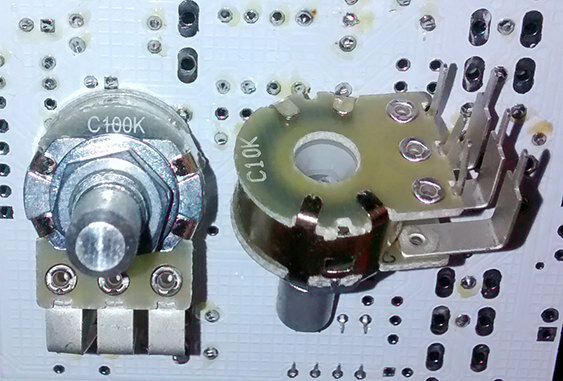 I looked at the schematics for these pedals with the C10K/C100K and they do not show which pot is which... the pot value fields are empty... anyone have ideas on this? I specifically was looking at the pinball and standout pedals in the collection.